If last year is anything to go by, 2018 is set to be packed with more ground-breaking research from the Faculty of Medicine. But with all of the work put into securing funding, recruiting for trials, collecting data, lengthy analysis – let alone the back-and-forth of the peer-review process – it can be hard to find the time to publicise your work outside of your peers. However, it really is worth making that investment. When the time is right, the College press office is here to help you get the word out about your research. The team includes former journalists and public relations experts with strong scientific backgrounds, a wealth of communications expertise, and most of all, an understanding of the news cycle and how the media works. Imperial College London was the host of Eurohaptics 2016, the main international European conference for researchers in haptics and touch-enabled computer applications. The conference was held at South Kensington over 4-7 July 2016 and was organised by Imperial College London in partnership with University College London, University of Reading, University of Bristol and University of Birmingham. 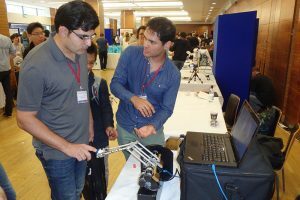 Eurohaptics 2016 was a great opportunity for researchers – drawn from disciplines such as neuroscience, psychology and robotics – to meet and present their work with the goal of improving understanding of the sense of touch from a physiological and perceptual perspective, devising new haptic devices and investigating better ways of controlling and interacting with them. Haptics is a growing field, with awareness amongst the wider public also on the rise thanks to the increasing use of haptic technology in mobile devices. Eurohaptics 2016 included public-focused evening events at the Royal Society and Royal Institution. Imperial College’s Centre for Engagement and Simulation Science (ICCESS) played a leading role in the conference, with Centre Director Dr Fernando Bello as both Programme co-Chair and local co-Chair, and Dr Alejandro Granados-Martinez showcasing the haptic rectal examination trainer he has developed. His innovative device attracted a great deal of media coverage over the conference period, with articles in the Daily Telegraph, Daily Mail and Vice Magazine, to name a few. Keynote speakers at Eurohaptics 2016 included Professor Stephen Brewster (University of Glasgow), Dr Henrik Jörntell (Lund University, Sweden) and Professor Blake Hannaford (University of Washington, USA), who acknowledged challenges in the design of haptic devices and how we could improve this by studying brain circuitry during tactile skin sensing and by enhancing the way we interact with them. Eurohaptics 2016 was attended by nearly 400 delegates from 26 countries and was therefore the largest event in the history of the conference. Read about the rectal examination trainer on the Daily Telegraph website. Listen to Guardian Science Weekly podcast on haptics featuring Dr Fernando Bello. Dr Michael Johnson’s (Department of Medicine) research into genetic networks for cognition (Nature Neuroscience) was featured in the Guardian, Telegraph and Daily Mail. Dr Tony Goldstone’s (Department of Medicine) new study into gut hormones and cravings was featured in international media including the Daily Mail, and the team have received various requests from broadcasters. Dr Oliver Ratmann (School of Public Health) was featured in BuzzFeed US, discussing his latest Science Translational Medicine paper into HIV transmission. If you would like to discuss media work around upcoming publications or projects please contact Kate Wighton.